Realm of Horror - News and Blog: Willard and Ben - UK BD Box-Set review. 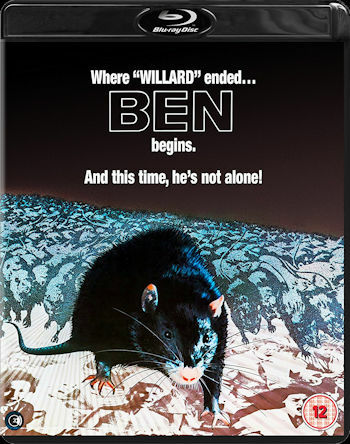 The rats are revolting in the cult horror films "Willard" and "Ben" which make their long awaited UK debut on Disc and Digital this month from Second Sight. 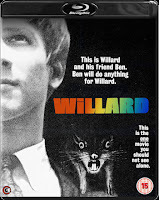 The first of the these "Willard" (1971), based on the novel 'Ratman's Notebooks', stars a young Bruce Davison (X-Men, TV's Kingdom) as the films titular character Willard Stiles. A downtrodden employee, working at his father's former company which is now run by his abusive uncle (played by noted character actor Ernest Borgnine - The Dirty Dozen, Escape from New York, RED). Overworked, undervalued and derided by everyone, including his overbearing mother, he has virtually no friends. Upon discovering a colony of rats in his back yard, he doesn't have the heart to kill them, so decides to keep them as pets instead, naming the largest 2 Ben and Socrates. But upon discovering he can get them to follow his commands, decides to use them to get back at his vicious uncle and anybody else that crosses him. Producing some highly amusing scenes as he uses the rats to disrupt his Uncles wedding anniversary and burgle some of his wealthy clients homes. Also starring Sondra Locke (a regular in Clint Eastwood films back in the 80s),Willard is a bit of a slow movie and isn't all that bloody, but is an enjoyable one none-the-less and certainly not one for sufferers musophobia. Following directly on from the events of the previous film, "Ben" (1972) see's the titular lead rat and his colony move out from the house and into the sewers, where they pop out from periodically to wreak havoc as they hunt for food. 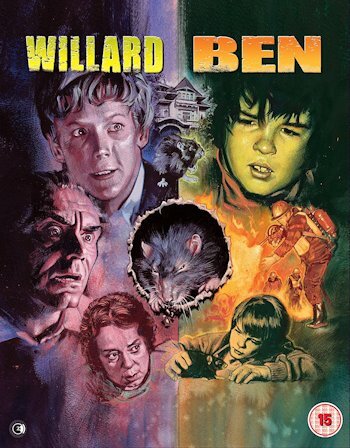 Ben however chances upon the home of a young boy, Danny Garrison (Lee Montgomery - Mutant, Burnt Offerings), who has a heart condition and doesn't have many friends and quickly takes ben in as a pet. But with the rat colony becoming increasingly violent and causing a number of deaths, and the authorities realising these are probably the same rats responsible for the deaths in the last film,Danny's friendship with Ben may be cut short, as they decide to take action and begin flushing them out of the sewers in some rather violent scenes involving flamethrowers and shotguns. Probably best known for featuring the Michael Jackson song "Ben" in the soundtrack, Ben is a strange kind of sequel. Parts of the film seem to be aimed at a younger audience, as it focuses on this lonely young lad and his friendship with his new pet rat, but this is interspered with people being attacked by rats and scenes of the authorities shooting rats with shotguns and blasting them with flamethrowers, which puts it at odds with the films more sentimental scenes. Both films proved extremely popular at US cinemas and were well recived on home video on both sides of the Atlantic. However, owing to various rights issues and the inability to find a decent print to take a scan from, the films have languished in relative obscurity since the 1980s, making these new releases from Second Sight welcome additions to their catalogue. A great selection of extras, which appear to be the same ones carried over from the US release by shout factory, that came out earlier this year. This release of Willard was taken from a 4K scan of the original negatives and has never looked better. Ben was taken from a Hi-Def scan from one of the best surviving theatrical prints available, which looks decent enough, but is exceptionally dark and grainy in places and not as sharp as its predecessor. But unless the original negatives can be found, this is the best we're going to get. Being made in the early 70s, "Ben" and "Willard" do seem fairly tame by today's standards but are both enjoyable slices of nature going on the rampage, which cult movie fans should love. I was sent the Blu-Ray discs to review, which are available seperately or as part of a box set featuring brand new artwork and a poster. The films are also available seperately on DVD. Ben and Willard are released to UK Disc Monday, 30th October from Second Sight.